What are Itoh or Intersectional Peonies? ITOH. (Roger F. Anderson,1999) This 6"-8" yellow cream bloom with picotee edge. 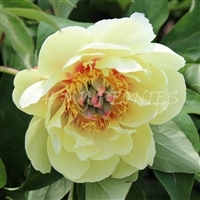 The apricot yellow petals are edged in deep burgundy which matches the dark centre of this intersectional hybrid peony. The plant remains in bloom for an extended period as the side buds open slowly. Itoh. (Anderson/Seidl, 1996) A peony for the romantic garden. The yellow petals, nearly cream-colored, are streaked of fine lines of a very pale pink. The margin of each petal is edged of rose. But it is the center of the flower that draws the attention! A crimson stain marks the basis of each of the ten petals, which surrounds a fine crown of white stamens. This contrast between the dark center and the very pale yellow petals illuminate the center of the flower. The stems are robust and carry the flowers well above foliage. Start sblooming at mid-season. ITOH. (Anderson, 1999) Seed parent Bartzella. First bloomed 1990. 24-26" height. Huge double flowers of a very dark pink at the opening that fades gradually. Gives a spectacular effect! A chameleon, it is a real traffic stopper! Itoh. (Donald Smith, August 2002) Intersectional double yellow blend whose opening buds are pink. Flowers are yellow heavily flushed and infused with pink. Combination of the two color stages give the plant a stage appeal. Side bud flowers are excellent quality and nearly as large as the terminal flowers. Last season, side buds were a bronzy orange. Gorgeous plant with multi-colors at various stages. Flowers are virtually unaffected by heavy rain, living up to it's name, Singing in the Rain. Very rare. ITOH (Anderson, 1999) Yellow with apricot hues. Light beige in bud, opening to semi-double to full double. Some blooms remain light yellow while others become very brilliant in color. Beautiful color combination. It has long stems and good green foliage. 2010 Award of Landscape Merit. Itoh. (Hybridizer unknown, before 1980) This variety was imported in Europe from Japan under the name of 'Tokon-oh Kagayaki' in the early 1980's. Not registered with the APS, "Shining Light" is a beautiful semi-double intersectional hybrid with a superb plant habit. Flowering right on top of the graceful foliage without any sidebuds. Beautiful fall coloring, "Shining Light" is a genuine trophy for the garden from early spring to late fall! ITOH. (Hollingsworth, 1984) A yellow single that blooms midseason. 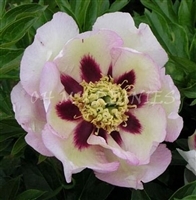 Paler at the edges with large dusky flares at the base this medium size flower is short and bushy. A very nice landscape plant .. matures at 20” high and 50-60” wide. ITOH. (Anderson, 1986) Late. Best Landscaper. Nearly full double. Large fluffy lemon yellow blooms. Fragrant. Very strong grower, an excellent garden plant which attracts extraordinary popularity. APS Gold Medal 2006. ITOH. Smirnow (Japan / USA), 1974, Itoh-hybrid – Paeonia lactiflora ‘Kakoden’ x P. lutea-hybrid ‘Alice Harding’, Yellow semi- to full double flowers with red flares at the base of the petals. Mature plants can easily produce a mass of flowers in between very fresh and green leaflets. Plant habit very typical for an intersectional hybrid. Flowers tend to 'hide' between the foliage. First ITOH peony. ITOH (Anderson, 1999) A pretty and different intersectional! Court Jester wears small flowers that first open a yellow-orange color with red-burgundy flares. A very nice looking flower. The main show comes when the secondary buds open as there are many. Flowers fade gently as they age toward a yellowish-creamy color.